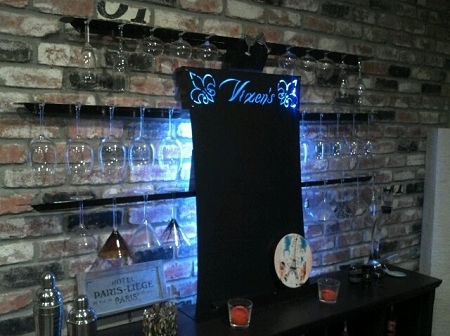 This is a 2'x3' chalk board that holds 30 glasses. It's back lit with color changing LEDs that are controlled with a remote control. The board is powder coated flat black and the rest is a copper/black vain powder.The logo cut out on the top is up to you we can cut whatever you light in it as long as it fits in the space.